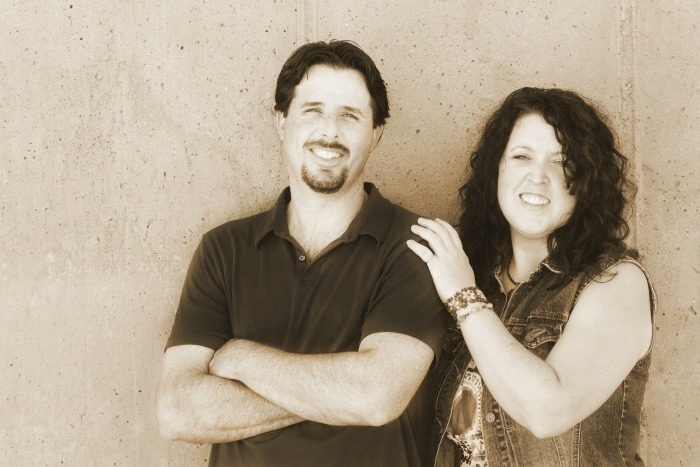 If you are new here, we are THRILLED to meet you. Please introduce yourself in the comments below and let us know one thing you love to salvage, aka rescue from loss, or WOULD love to salvage. Alright, now onto this week’s project………………. You know it has to be some sort of salvaging, in this case thrifting, going on right? 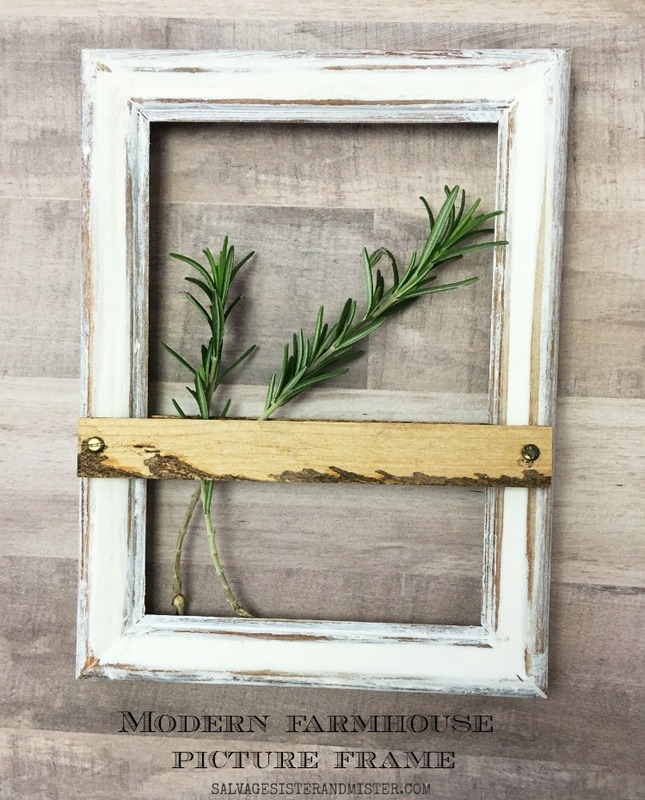 We took a 25 cent frame and gave it a modern farmhouse feel. *Affiliate links are shared to show like or similar products used. You can read our full disclosure policy HERE. 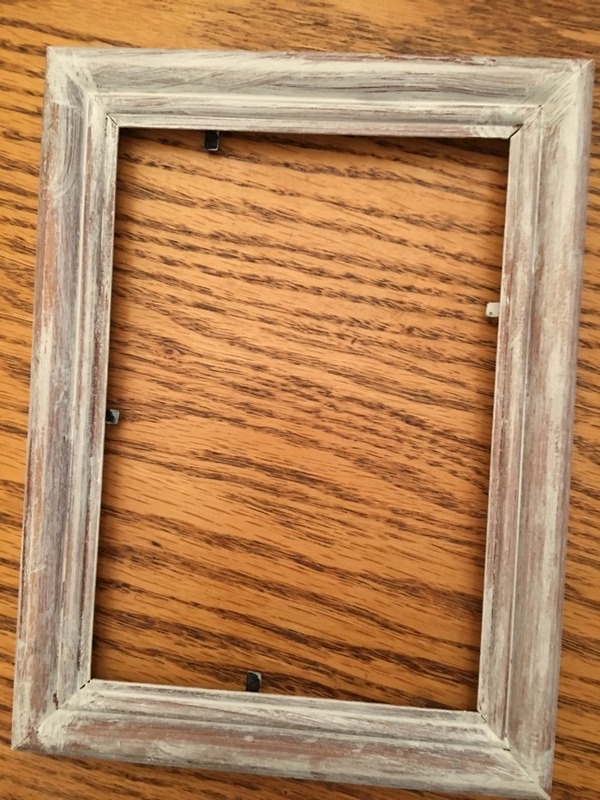 Painted over frame with white paint. Sanded some parts down to make it a rustic look. Since we didn’t want the curves of the frame, we spackled, using a putty knife, the inside to create a more flush look. The spackle dried overnight and was sanded in the morning to smooth it out. Scrap wood pieces were cut, with the mini saw, for the back and front. The front was measured out to go all the way across. 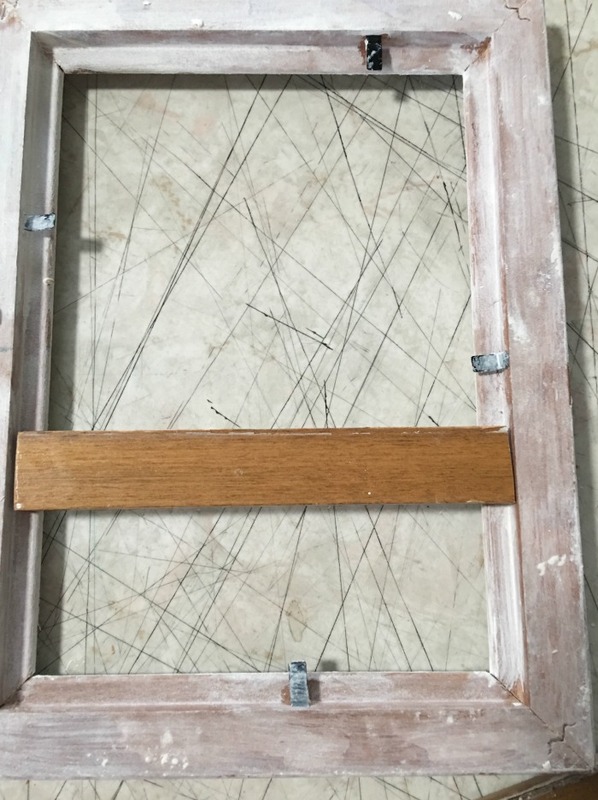 The back piece fit inside the frame opening so it would easily hang on a wall. The back scrap wood was attached with hot glue. The front piece of wood was laid across the top. A pilot hole was drilled on each end. With a screwdriver, the scrap wood was attached to the front. Tip – If using spackle, screw on the wood side rather than the spackle side so it doesn’t crack. 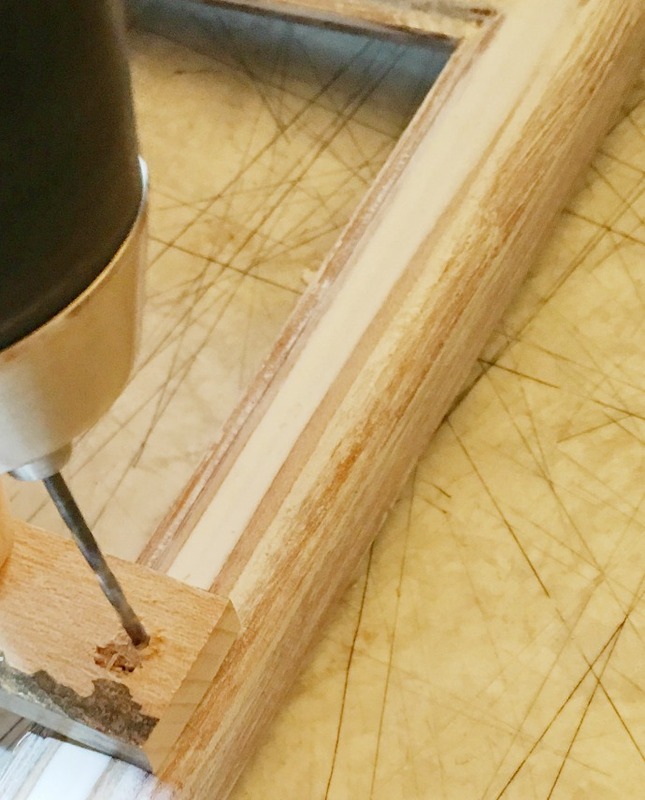 Add whatever flower/greenery stems you like and your modern farmhouse picture frame is ready to go. Now, you can customize this however you like. We didn’t want to paint the wood trim but you obviously could. Another thought would be to stamp words on the scrap wood pieces i.e. love for Valentine’s Day. Since we wanted this super easy and customizable, it was left as is. Thanks for joining us today. If you want to stay up to date with our projects, you can sign up for our email newsletter. 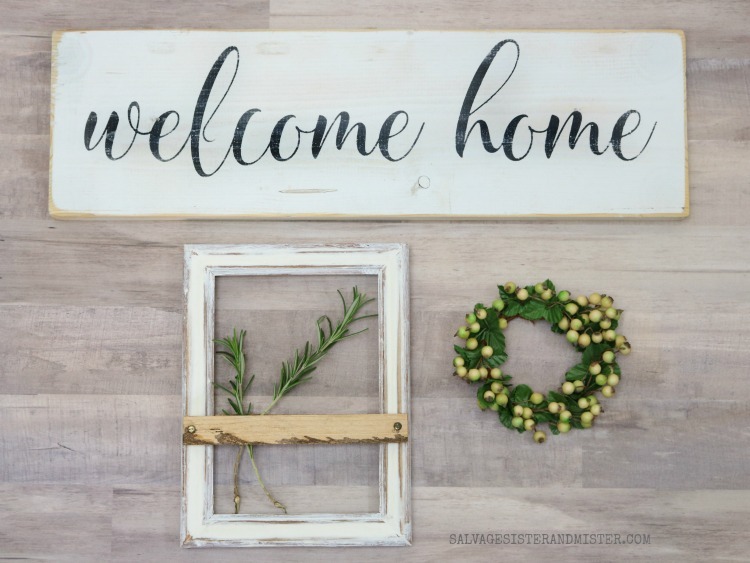 AND, if you love farmhouse, we have more projects here or get THRIFTING tips HERE. That’s so cool Deborah, I love this look. If I may ask, I have absolutely no idea what spackle is? I haven’t seen it in the shops here in South Africa. Is it like body putty or something? Hey Michelle, It is the stuff you add to the wall to fill in holes, like before you paint. I have a link to the exact product we used (via amazon) if that helps. Such a clever repurpose of an old frame! Love that you can add fresh greenery to it! Very cute Deborah. 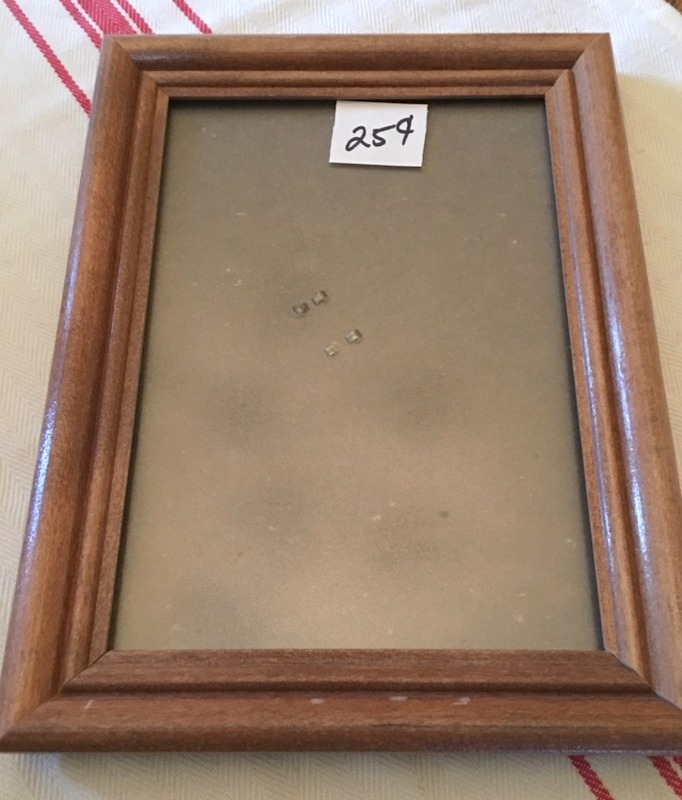 Such a clever thrift store upcycle….and the price was definitely right. Great upcycle! Perfect farmhouse look. Thank you for sharing on Merry Monday! Hope to see ya next week! Thanks so much Kim for stopping by! Love this idea and love, love your blog name! So does the stem just stay put with the one trim piece (against the wall to hold)? Hi Laura, Yes, the Rosemary stems just stayed in place behind that trim piece. It needs to be a sturdy stem to stand up. Wow! That is a beautiful makeover! I see these frames all the time at the thrift store and walk right by them. You have a great vision for upcycling objects. Audra, For sure, they are all around. Ok this is gorgeous! So chic and simple! I love it! Charlene, Thank you so much. It was cheap and cheerful for sure. Very neat! Great transformation of a frame. Visiting from Creativity Unleashed. Victoria, You are so sweet. You know I love all your projects. Thanks for stopping by. This is a super cute idea! Simple projects like this are the best and show that anyone can do it! Well done.